Ajax will face Real Madrid on the 5th of March in a crucial Champions League return leg tie at the Santiago Bernabéu. 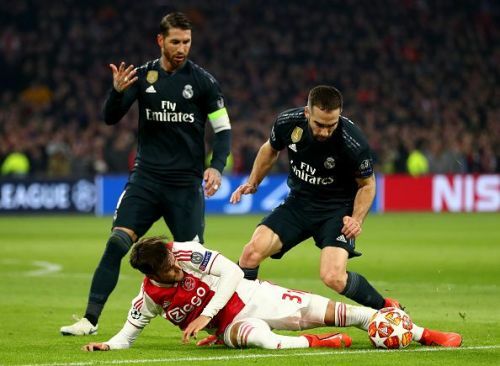 After the controversial 1-2 defeat in the first leg, Ajax will have the chance to retaliate and knock the mighty Madrid out of the Champions League. Though it has been 22 years since Ajax last won a knockout stage tie, they must keep faith in themselves to pull this Herculean task through. Real Madrid will come into this game with a 100% winning percentage against Ajax in all competition having scored 22 goals in seven matches and only conceded thrice. Though their recent domestic form is awful after being beaten consecutively by their bitter rivals Barcelona. On the other hand, Ajax will come into this game on the back of two successive wins in the domestic league and a recent thumping 3-0 win against Feyenoord in the cup. The Dutch side have never beaten Real Madrid in their history, but this is their best chance to make a statement and lay the defending champions out. Real’s recent form has been terrible. They have lost to Barcelona on two successive Clásicos in their own backyard and their morale is very low at this moment. Real Madrid forward, Karim Benzema has scored only one goal in the last four games and is having a dry patch after starting the season well. Though, Vinícius Júnior played well in the first of the two El Clásicos but his lack of lethalness in front of goal is a big problem for Real Madrid. On the other hand, Ajax’s recent form has been magnificent. Their star striker Hakim Ziyech has already scored 15 goals this season and his recent brace against Den Haag in the Dutch League is proof that he has no intention to slow down. Ajax’s Serbian winger Dušan Tadić has found the form of his life after coming to Ajax. The former Southampton man has scored 16 goals this campaign and will be a constant threat to Real Madrid defence. Real Madrid will have to play the return leg without their inspirational leader, Sergio Ramos. The four-time Champions League winner was retrospectively handed an extra game to his suspension for picking up a yellow card in the reverse fixture. His Spanish teammate Nacho is expected to replace the Madrid captain at the heart of the defence which may prove to be costly in the outcome of the game. Apart from Ramos, Marcos Llorente is doubtful for Madrid. In the first leg at Amsterdam Ajax dominated the whole first half and should have gone 1-0 up. The high pressing of Ajax pushed Madrid back and the tempo Ajax had throughout the game is truly appreciable. If they can replicate this courageous and bold display in Madrid, they will create chances against the catastrophic Madrid defence. The only thing Ajax must improve is that they have to be more clinical in front of goal to stand a chance. Ajax has to take a leaf out of Barcelona’s book on how to dent a hole in Real’s aggression in Santiago Bernabéu.